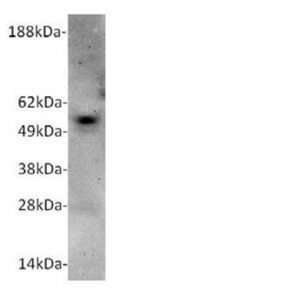 Human Gelsolin (UnitProt # P06396) is a potent calcium regulated actin filament severing protein that works to disassemble and reorganize the actin network. 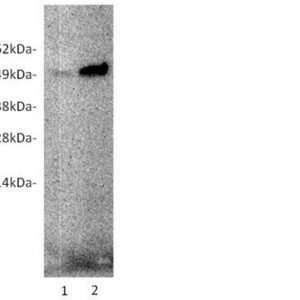 The extracellular isoform, plasma gelsolin, is suggested to act as an actin scavenging protein. Decreased levels of plasma gelsolin have been reported in trauma, burns, rheumatoid arthritis, and alzheimer disease.e. 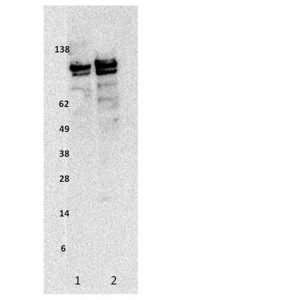 Blot was probed with 0.2μg/mL R3005 followed by HRP detection antibody. Human gelsolin was detected at 95kDa.